There are two ways to fix the above 2 issues. In this video, we will discuss using an XML file and in our next video, we will discuss using a database table. Delete all these 8 images. 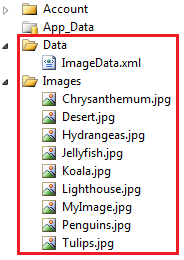 Now copy the images with their original names from "C:\Users\Public\Pictures\Sample Pictures". At this point your solution explorer, should be as shown below. <asp:Button ID="Button1" runat="server" Text="Stop Slideshow"